Manufacturers typically keep details close to vest, but Detroitisit has pulled some strings and lifted some covers on the key debuts scheduled for the 2018 NAIAS. With light trucks now accounting for nearly two-thirds of the American market we can expect SUVs, CUVs and pickups, to dominate the show, but expect a few alternatives for those who still like the more conventional passenger cars. Acura RDX: Honda launched the first Japanese luxury brand more than three decades ago, but Acura has been lagging behind key Asian, American and European competitors in recent years. So, it’s got a lot riding on the launch of the 2019 RDX remake. The compact crossover-utility “represents the most extensive Acura redesign in a decade,” according to Acura officials. It picks up on the well-reviewed Precision Performance Concept first revealed in Detroit two years ago, introducing a more bold and distinctive look – as well as plenty of new safety, infotainment and creature comfort technologies. 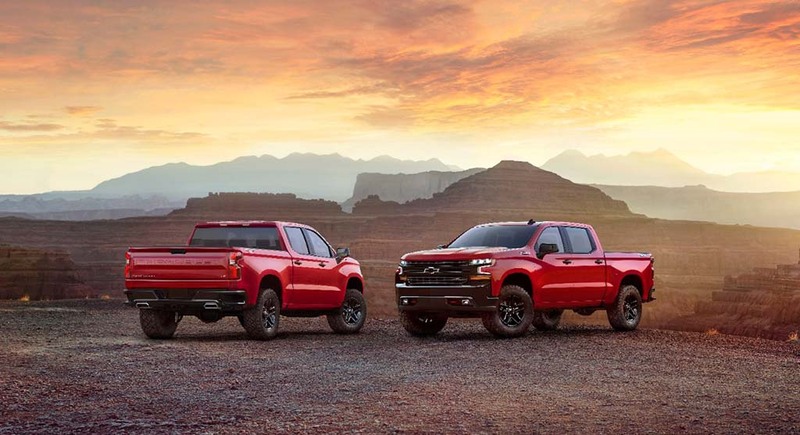 Chevrolet Silverado:  While SUVs and CUVs might get most of the attention, pickup sales are not far behind, and competition is going to heat up big time as all three Detroit automakers have major intros scheduled for 2019. That includes a complete remake of the Chevrolet Silverado. Unlike Ford’s current F-150, Chevy isn’t switching to aluminum, but it will use new steel alloys to both slash weight and make the 2019 Silverado more rugged. Meanwhile, it offers a more stylish look than the solid but visually uninspiring pickup it replaces – as well as lots more tech features. Honda Insight: The 1999 Honda Insight was the first hybrid-electric vehicle sold in the U.S. and it was both a technical tour de force and sales dud, unlike the Toyota Prius launched just months later. A second Insight fared little better. Will the third time be a charm as Honda readies a new Insight model for 2019? The new one is far less quirky in design and shares its basic underpinnings with the wildly popular Honda Civic, but it’s ever so slightly larger and more lavishly equipped. Honda promises segment-leading mileage as well as much better performance with a new, two-motor hybrid drivetrain. Infiniti Q Inspiration Concept: Infiniti has been doing a fan dance, offering some brief teases hinting at the radical styling of the new concept it plans to unveil in Detroit. Just ahead of the NAIAS it has lifted the veil and revealed a stunning fastback it has dubbed the Q Inspiration Concept, a clear paean to its original Q45 flagship sedan. It won’t be a pure electric but it apparently is designed to steal some space from the engine compartment — as the luxury brand shifts to smaller, higher-tech engines, like the new Variable Displacement-Turbo – to deliver a roomier cabin. Jeep Cherokee: The all-new Jeep Wrangler will soon be getting company, FCA’s off-road brand set to give a significant update to the Cherokee nameplate. The once-popular badge was introduced in 2014 and kicked off plenty of debate with its distinctive, two-tier lighting design. The 2019 update opts for a bit more controversial look aimed at bringing more buyers into the brand, Jeep aiming to reach global sales of 2 million before the end of the decade. The other big news for 2019, according to several reports: a possible “mild” hybrid drivetrain. Lamborghini Urus: Luxury SUVs are all the rage, with just about every high-end brand offering one now. But Lamborghini plans to take things to a new level with the 641-horsepower Urus – which, like all Lambo models is named after a bull, the brand’s logo. Likely to start at something over $200,000, expect it to be the world’s fastest SUV, or so the Italian automaker promises. But it’s likely to be getting some serious competition in the not-too-distant future, as Ferrari is now prepping its own hyper-car. Incidentally, Lambo actually offered a limited-run SUV decades ago, the Lego-like LM-002. Ford F-150 Diesel and Ranger: Dearborn Michigan weighs in with two new pickups for 2019. The visual changes will be modest with the 2019 F-150. But buyers looking for extra towing and cargo capacity will find beauty is more than skin deep thanks to the addition of the F-150’s first diesel option. It also is expected to nudge somewhere around 30 mpg. Then there’s the return of the Ranger. Ford dropped its midsize pickup in 2012 – in the U.S., anyway – launching a new model just about everywhere else. Now, it has come up with a version tuned to the American market. Set to roll out of Ford’s remodeled Wayne assembly plant, the 2019 Ranger will eventually share its platform with the reborn Ford Bronco SUV. BMW X2: SUVs now dominate the American market and, as they did with the sedans of the past, automakers are rapidly expanding their range of offerings. The X2 shares the same platform as the recently added X1 subcompact BMW, but it adopts what design chief Adrian van Hooydonk calls “an expression of modern and extrovert vehicle dynamics.” Translation: a more coupe-like body style and sporty driving experience. It’s twin-turbo four-cylinder engine will punch out 228 horsepower, enough to get it to 60 in just over six seconds. Ram 1500: Fiat Chrysler’s full-size pickup has long been a visual stand-out, but the automaker is intent on proving that the 2019 remake can be as rugged, capable and fuel-efficient as the big offerings from Ford, Chevrolet and GMC (the latter set to launch an all-new Sierra truck later this year). Look for increased towing and cargo numbers, better mileage and a lot more high-tech safety and infotainment features, many of them intended for the contractors and professionals who still dominate the full-size pickup segment. Rolls-Royce Phantom: The British marque has been an on-and-off attendee at the Detroit Auto Show. This year, it’s one of a dozen of the industry’s most exclusive brands taking part in the limited-run, invitation-only “Gallery” event that overlaps with the NAIAS media and industry previews. The flagship, $400,000-plus Phantom made its global debut in Europe, but it comes to Detroit for its North American launch. As you’d expect, the eighth-generation phantom will feature plenty of new technologies while continuing what Rolls calls “the Embrace,” endless fields of premium leather and wood. Volkswagen Jetta: The “people’s car” brand has been shifting gears, putting a lot more emphasis on new SUVs, like the compact Tiguan and seven-seat Atlas. But VW isn’t about to abandon its traditional passenger-car line-up, or the buyers who want its distinctive blend of German sportiness and reasonable pricing. The new 2019 Jetta will share the same, versatile MQB platform as the latest-generation VW Golf. One thing that traditional buyers won’t find this time is a diesel. “Oil burners” have been banished in the wake of VW’s emissions scandal. But some hint a hybrid, even plug-based Jetta may be coming. GAC EV: We’ve seen plenty of Chinese automakers come to Cobo Center over the last decade but they’ve yet to actually put product on sale in the States (unless you count a limited-edition Volvo sedan and a small Buick SUV). This year could be the real breakthrough, as GAC Motor, (a company that was recently rumored to be bidding for Fiat Chrysler) is determined to crack the barrier, company President Yu Jun calling that “an essential step.” GAC will launch in Detroit an all-new EV sedan aimed at younger buyers. It will also display at least three other models, including the GM8 minivan, GS8 SUV and GA8 luxury sedan.